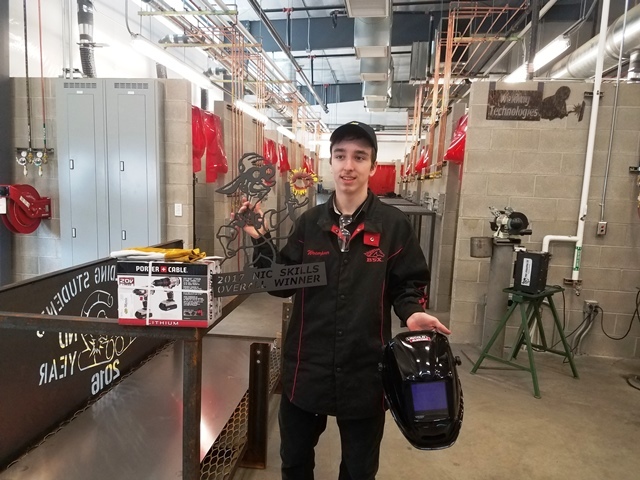 Pictured is Tavis Woempner, of Lakeland High School, who was the overall winner of the 2017 regional Skills USA welding competition hosted by NIC. A total of 22 high school students from Kootenai Technical Education Campus, Lakeland High School and Sandpoint High School participated in the regional Skills USA welding competition hosted by North Idaho College March 17. NIC welding instructors, students and former students acted as judges in the event. Winners will go on to compete in the statewide Skills USA competition April 7-8 in Nampa, Idaho. Pacific Steel donated all the welding materials while Cd’A Metals, Oxarc and A-L Compressed Gases donated prizes for the top winners, who competed in Shielded Metal Arc Welding, Flux-Core Arc Welding, and Oxygen/Fuel Cutting.